September has arrived and you know what that means right?? Besides back to school, it means that the next official iOS is rolling out! So of course because I’ve been testing the beta version and this one is going to be a good one! So I thought I’d share my favorite features with you so far! You know that little menu you swipe up from the bottom of the screen..yeah that one. I like that in iOS 11 you can add things to it or remove them! 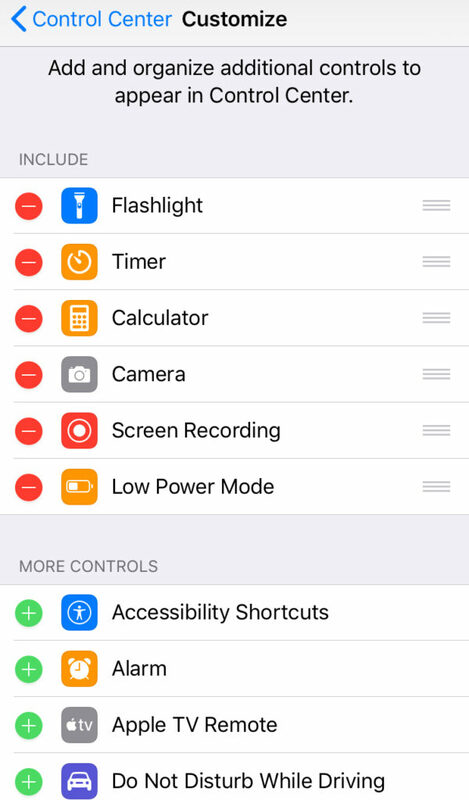 If I don’t want the camera or flashlight there I can remove them. Now the standard parts like the music, bluetooth, wifi can’t be removed but that’s not a big deal and quite frankly for quick access they should remain. There’s a vault if you will for your passwords, if you’re like me and chances you are if you’ve got a smartphone of any kind. You can now store passwords for different sites on your phone. If you work in an enterprise environment you may be familiar with this type of technology. And you need touch ID enabled to access it so it’s not simply knowing the passcode you created to get in there. Notes — Not new but improved! You can now do more with your notes! You can scan receipts, take pictures or video directly from within notes or add photos from your camera roll! Sometimes you need to do a bit more when taking notes and this definitely helps, you can even add tables into it. Productivity boost!